The Strait of Georgia is truly a paradise waiting to be discovered by boat. 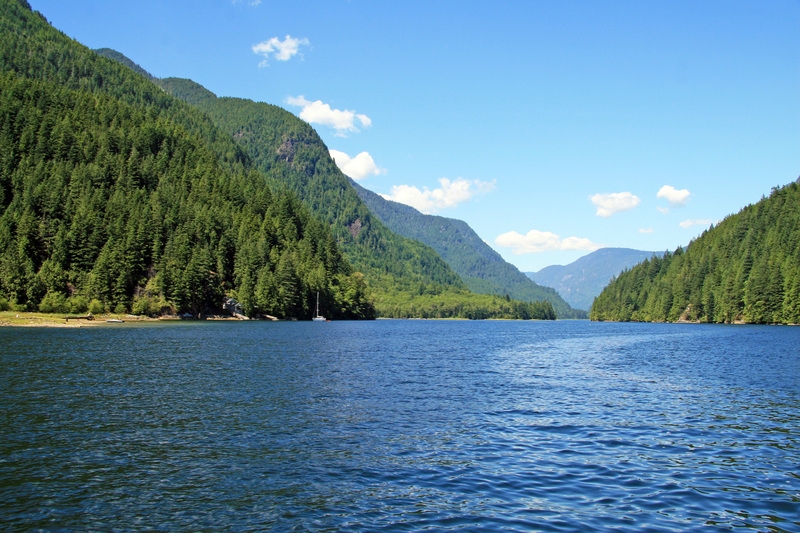 The south coast of British Columbia is an expansive body of water protected from the big winds and waves of the Pacific Ocean by Vancouver Island. The Strait of Georgia is truly a paradise waiting to be discovered by boat. The challenge is where to start and how much time can you spend to explore its vast array of coves, inlets, islands and communities. But if you happen to reside on the coast, it is a great challenge to have. With a decade between me and my last trip to the West Coast, I made a call earlier this year to Dan Greenwood, a long-time friend who has helped organize many PowerBoat TV adventures over the past 25 years. 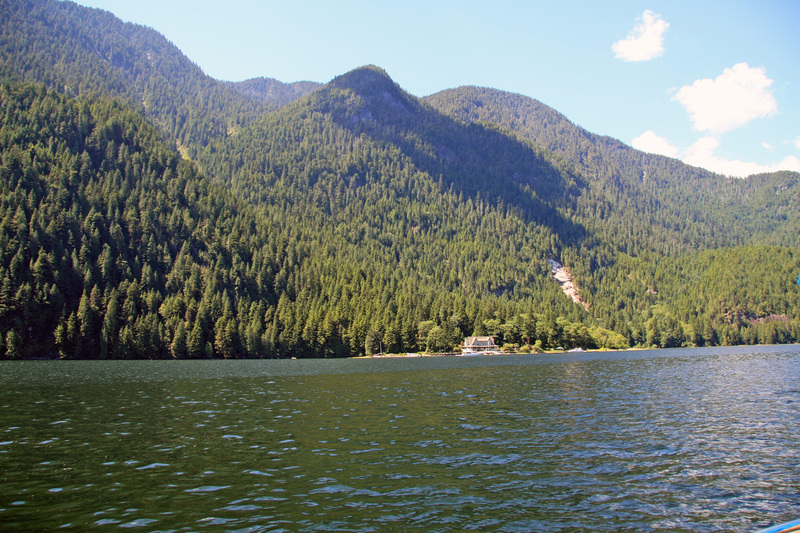 Plans were made, flights were booked and on July 8 we arrived in Deep Cove on Indian Arm with our pile of gear. While waiting for Dan to arrive, it was more than pleasant to just sit back and take in the sights of Deep Cove from the head of the wharf in Panorama Park. Many kayakers and dinghy sailors from the paddle and yacht clubs were taking advantage of the early morning calm in the sheltered bay. Within minutes of the appointed time, Dan cruised into the Deep Cove in his daily commuter, a Campion Explorer. 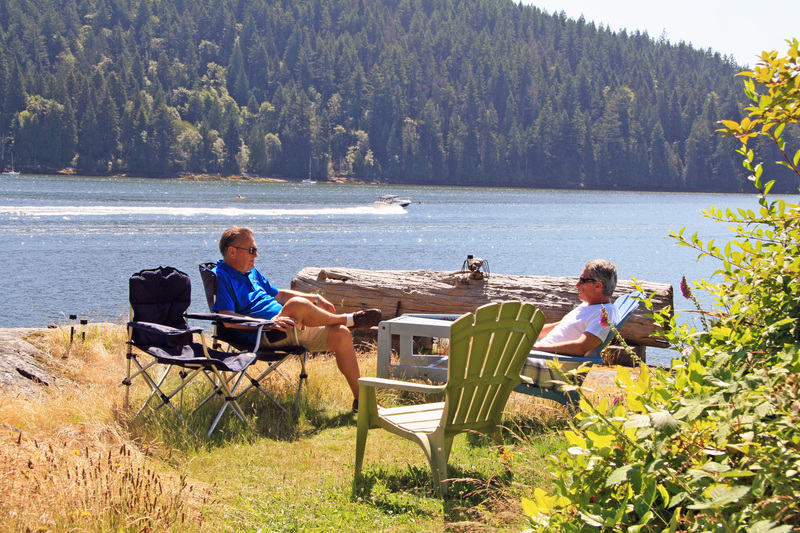 After trading comments on whose hair was now greyer, we were off to Dan’s island retreat. Needless to say I was envious of his daily commute across the waters of Indian Arm. Within minutes, Boulder Island was in view off the bow. Eagles perched high in the evergreens and a deer wandered about the island having swum over from the mainland. After landing Dan took us on a walk around the island. Strolling along the paths, starting to relax and slow down, I could really appreciate why he had chosen to live here. 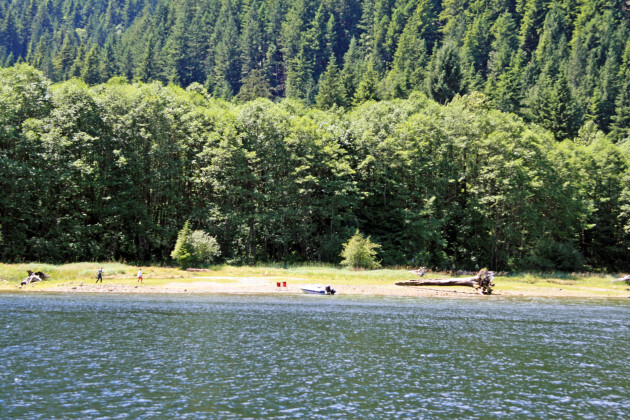 While only seven nautical miles from downtown Vancouver by water, the island seemed worlds away. Eagles perched high in the evergreens and a deer wandered about the island having swum over from the mainland. Sitting on a small bluff looking out across the waters of Indian Arm, Dan and I had chatted about his choice of lifestyle. 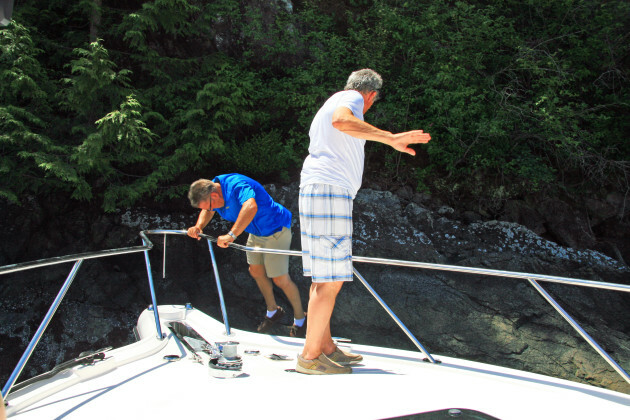 As the owner of Greenwood Yacht Sales and Services, his workday is on the water – listing and showing boats for his brokerage business or delivering yachts throughout the Sunshine Coast. 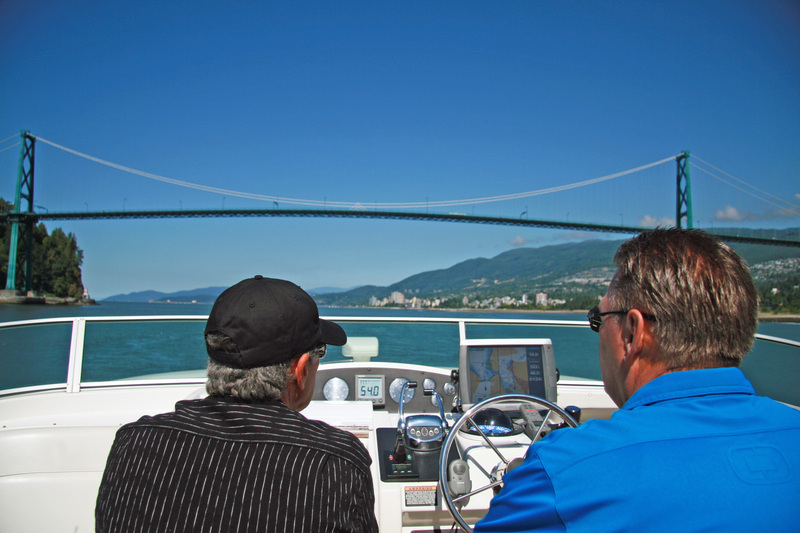 Living on the water and travelling to meet customers and show boats made perfect sense. He may “live off the grid” in many respects (without city services, cooking and heating his home with wood), but thanks to modern digital technology he can still run a business from the island. Living on or close to the water is a reality for many on the West Coast due to the moderate climate. As luck would have it, a couple who had just purchased a boat from Dan were visiting, so I headed over for a chat. Joanne and Glenn Barefoote had met through their love of boating. Following their boating themed wedding, they started looking for a live-aboard cruiser that would allow them to sell both of their sailboats, homes, countless possessions and start living the West Coast live-aboard dream. Their new life had just begun this summer after Dan found them a 47-foot 1975 Chris-Craft Commander in good shape that had recently been upgraded with new diesel power, generator and tanks. More modification and upgrades are planned but their mailing address is now care of Shelter Island Marina on the Fraser River – home to 80 live-aboard vessels. For now, they are enjoying the summer and their transition to their home that travels with them. 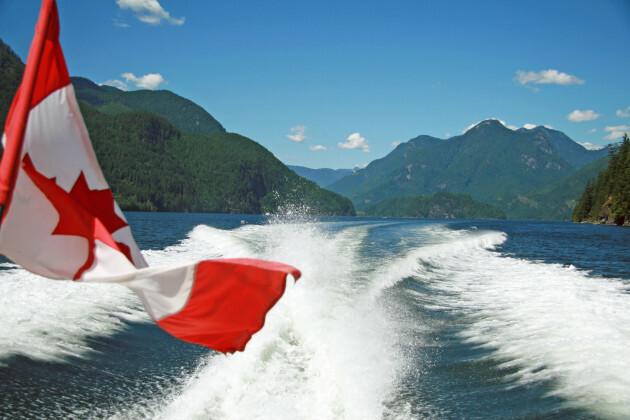 It is a supremely scenic cruise over its entire length, which offers boaters calm, sheltered waters and great proximity to Vancouver. While I was visiting with Joanne and Glenn, Fred Warriner from Far Point Marine arrived with a Tiara 39. 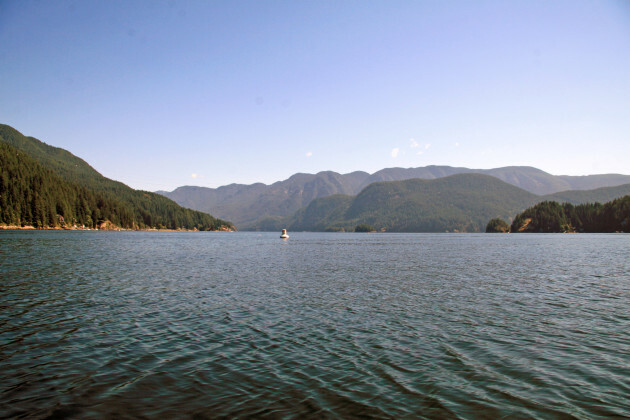 We hopped aboard and headed out to cruise Indian Arm, a continuation of Burrard Inlet and Vancouver Harbour that heads inland for 11 nautical miles. 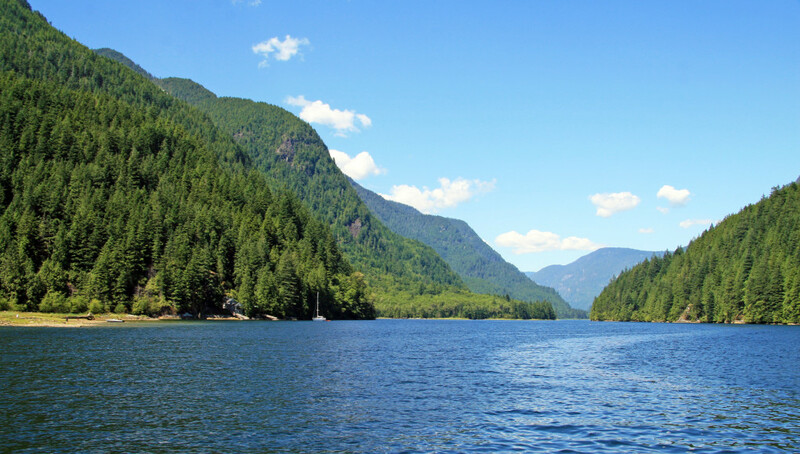 Once clear of Vancouver and heading past Deep Cove, the wilderness returns. 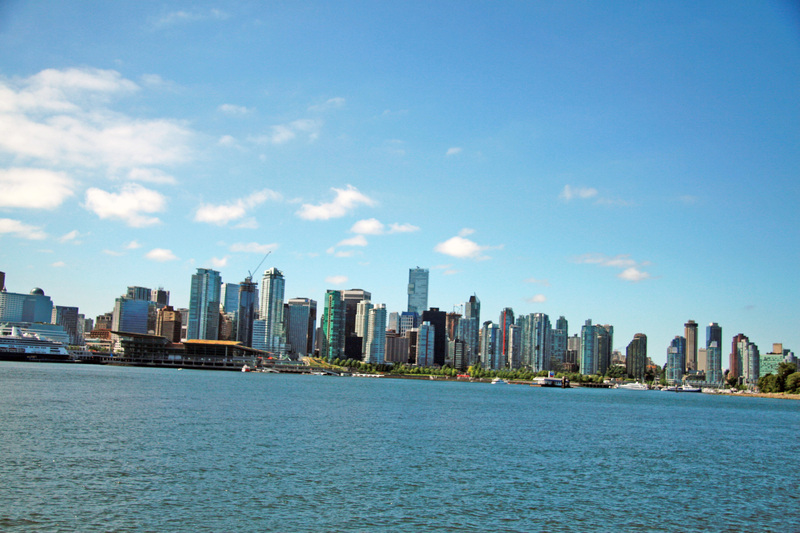 It is a supremely scenic cruise over its entire length, which offers boaters calm, sheltered waters and great proximity to Vancouver. Established in 1996 and protecting almost 24,000 acres, Indian Arm Provincial Park protects dominates the shoreline and both sides of this fjord. 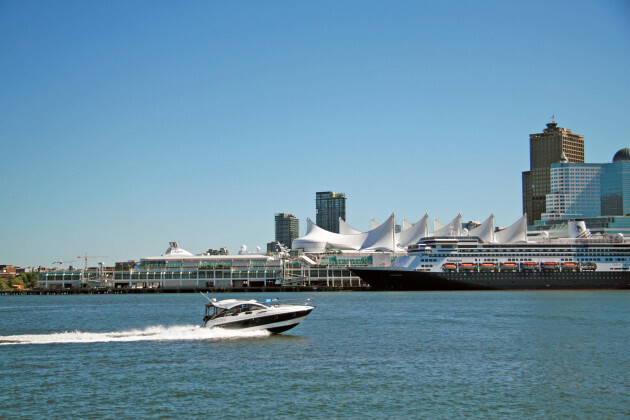 With its proximity to Vancouver and several marine parks, the waters can be busy with all types and sizes of watercraft on summer weekends. 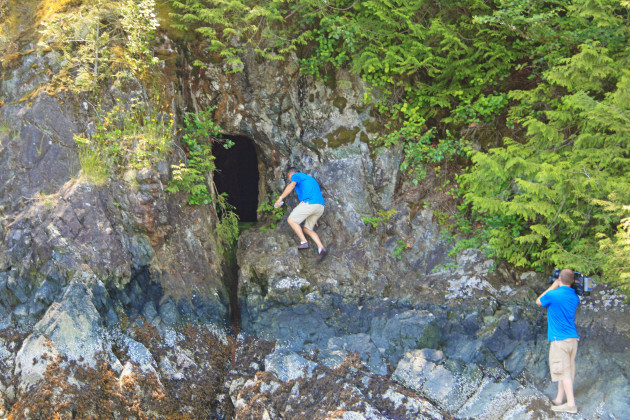 Along the western shore, there is an old mining tunnel carved into the mountain that is quite tough to spot but well worth finding. If the tide is right, you can edge up to the shore and hop off for some exploring. Just remember to bring flashlights since it is quite dark and only a single plank leads across a water-filled shaft. One mystery to be found here is the simple paintings of a man and a deer, which show up quite well when the rock face is wet. No one knows who created them or why. With the sunshine calling from the tunnel entrance, we headed back out to board the Tiara – a bit of a challenge to say the least. After a short cruise enjoying the salt- and pine-scented air, as well as the spectacular scenery, we once again nosed in to the western shore. 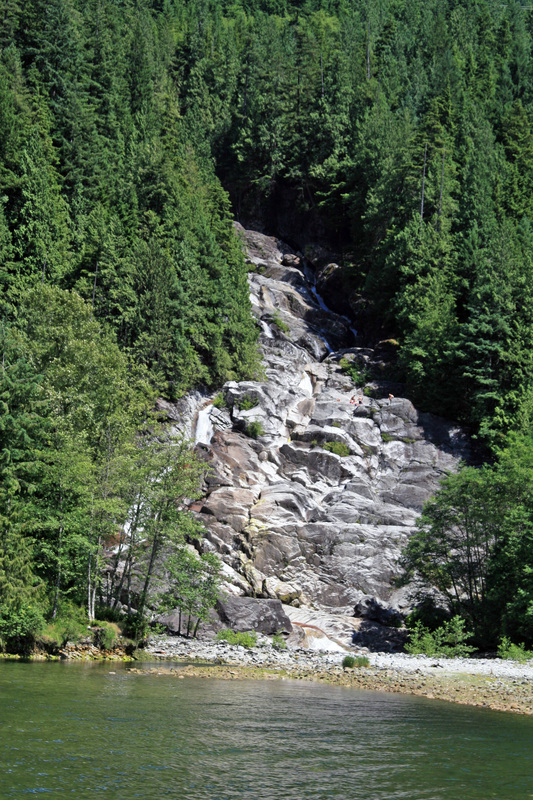 This time it was to get a closer look at Silver Falls, which comes from the top of Mount Seymour and is the outflow of Elsay Creek into the fjord. As we covered more water, Indian Arm narrowed and was split by Croker Island. Passing west of the island brought us past Bishops and Clementine marine parks. The view looking to the head of Indian Arm is truly special against the backdrop of the snowcap on Mount Felix. Once clear of the island, the Wigwam Inn came into view. Started as a luxury resort and fishing lodge in 1910, it earned a shady reputation as a gambling house after the Second World War. 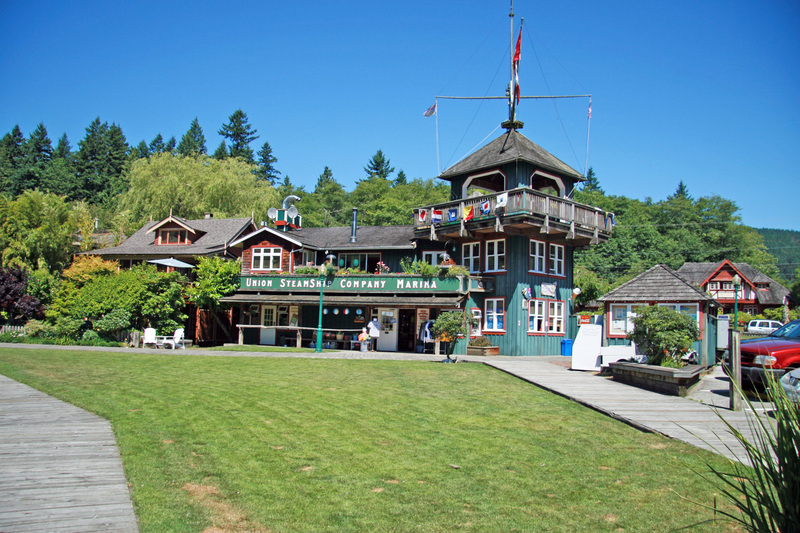 The inn is now owned and operated by the Royal Vancouver Yacht Club as an outstation for its members. 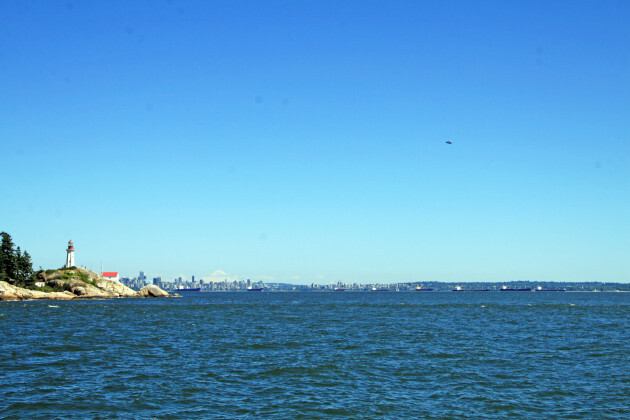 Whether you are a member or not, the protected waters past Crocker Island are a popular anchorage. Impressive enough in the summer, these falls really put on a show in the spring. Turning southeast to head outbound on the opposite shore provided a spectacular view of the coastal range and the old growth forest of the park. 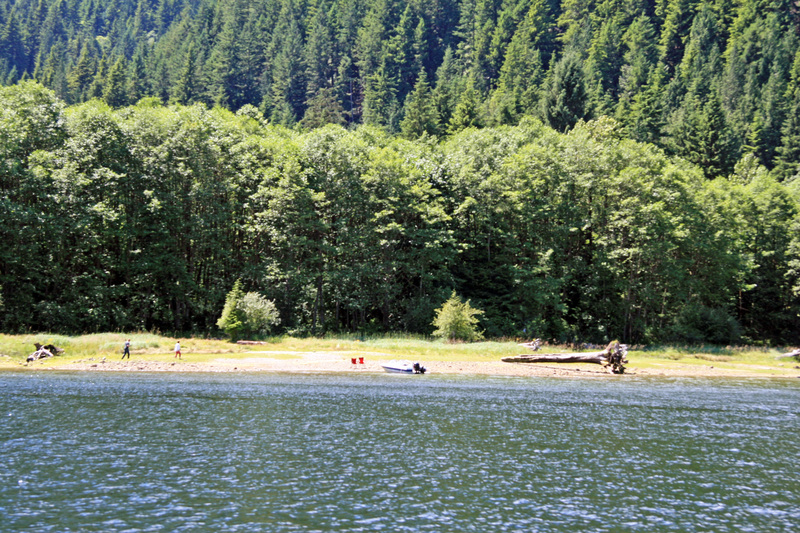 Along this shore is popular Granite Falls Marine Park. Once a bustling granite quarry, it is easily identified by the mined area around the falls. Impressive enough in the summer, these falls really put on a show in the spring. 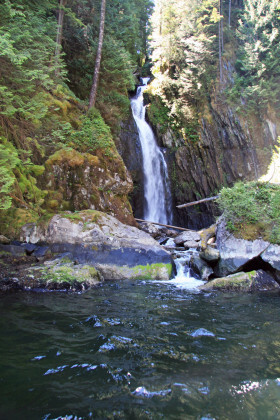 It is possible to anchor north of the park’s small craft docks with a stern line to shore if you would like to overnight in order to enjoy a campfire on shore and perhaps climb up to the top of the falls. 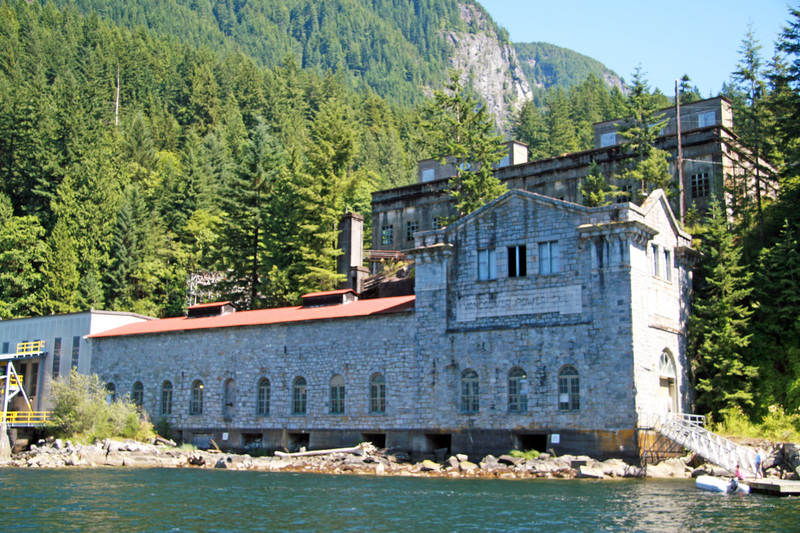 Our final stop was to check out Vancouver’s first hydroelectric plant, the Buntzen Powerhouse. Built in 1903, the plant’s turbines continue to generate electricity using a lake high above. 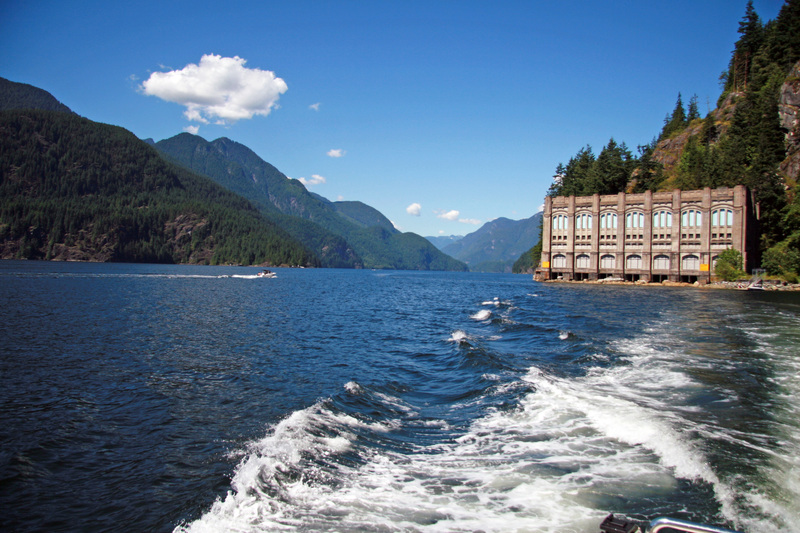 While still part of BC Hydro, the power is now sold to Seattle. With the afternoon marching on, we decided to pick up the pace for the run back to Deep Cove, while kicking back and enjoying the view. 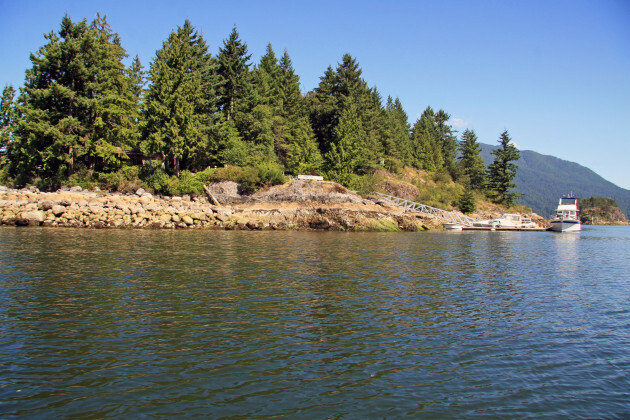 A special place for visitors and locals alike, Deep Cove boasts a great waterfront with a park and public wharf. The view from either at any time of day is truly spectacular. It’s a great place to sit and relax or hang out on your boat after a tour of the shops and restaurants along Gallant Avenue. 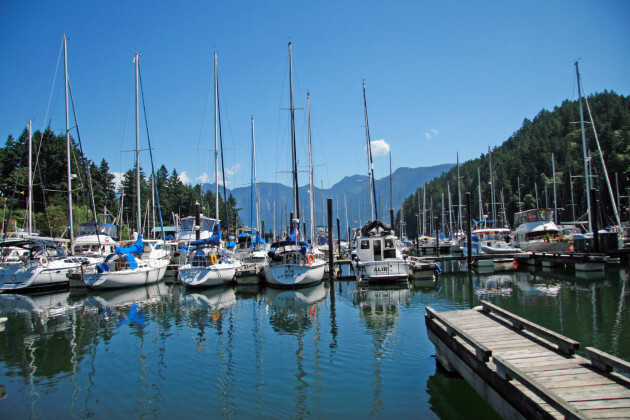 Deep Cove Marina offers fuel, services and transient berths. You can also tie to the public wharf or anchor out. Dan had arranged for Nick Polessky to host us on his Meridian 5788 for a cruise out to Howe Sound from Vancouver’s Coal Harbour Marina. 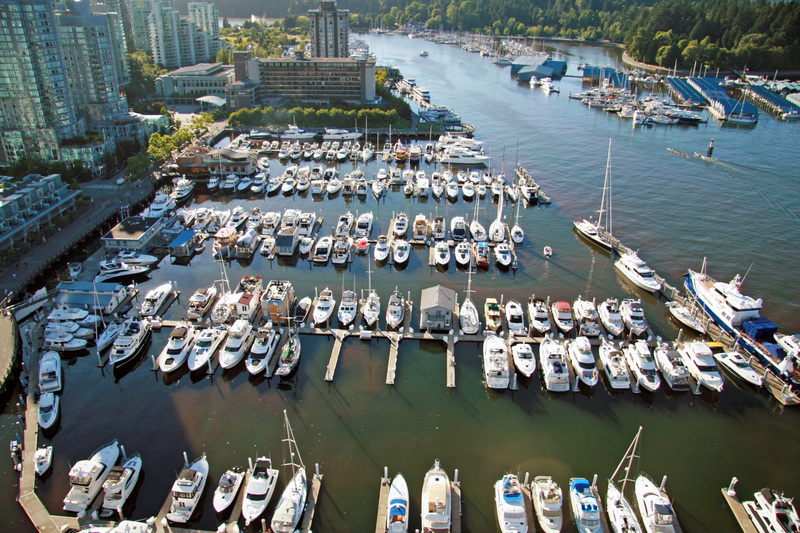 Given its world-class facilities, a backdrop of towering condos and the north shore’s Stanley Park, it is hard to believe this marina was a coal mine before the Union Steamship Company made it a major maritime centre. 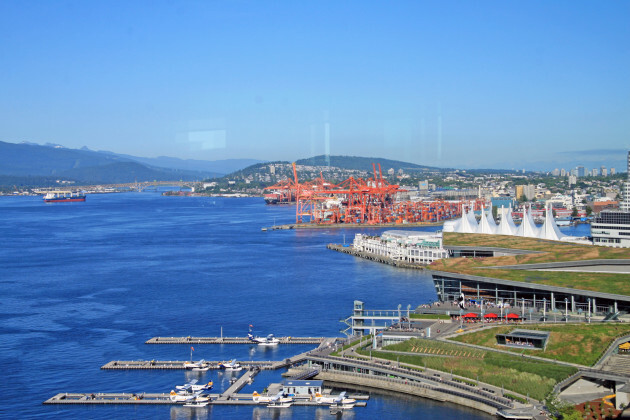 From the marina, you can head out to cruise Vancouver’s skyline, take in the city’s waterfront or cruise a host of destinations with the coastal mountain range as your backdrop. Just be mindful that you really need to be on your game while boating in busy Vancouver Harbour. 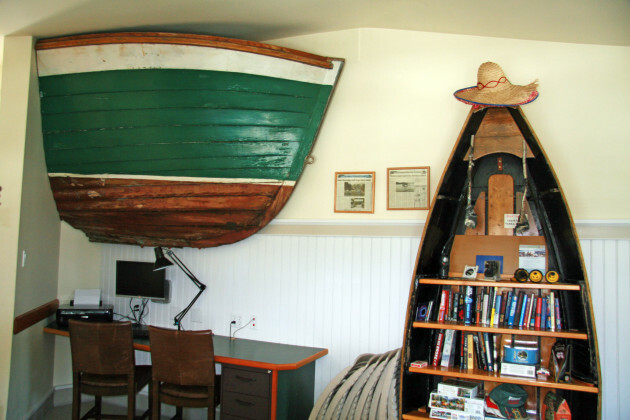 It’s traffic ranges from paddlers and rowers, to seaplanes, ocean liners, ferries and freighters – not to mention a wide assortment of pleasure craft. Departing Vancouver through First Narrows, you will pass by Stanley Park and under Lions Gate Bridge. From the narrows, it can be a rough ride (even in a 58) until you round the light on Point Atkinson and turn into Howe Sound, where the water usually settles down. As the sound heads inland, the mountains rise straight out of the water, creating a backdrop that can’t be rivalled. 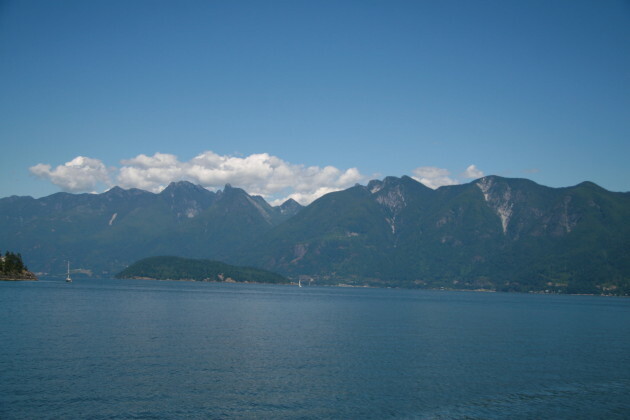 Howe Sound is a popular spot for day boaters, cruisers and cottagers since it is only nine nautical miles from Vancouver. Bowen, Keats and Gambier islands are the primary destinations. As the sound heads inland, the mountains rise straight out of the water, creating a backdrop that can’t be rivalled. As you navigate these waters, keep an eye out for floating logs and debris that break away from the many tows moving logs to the mills on the inlet and beyond. 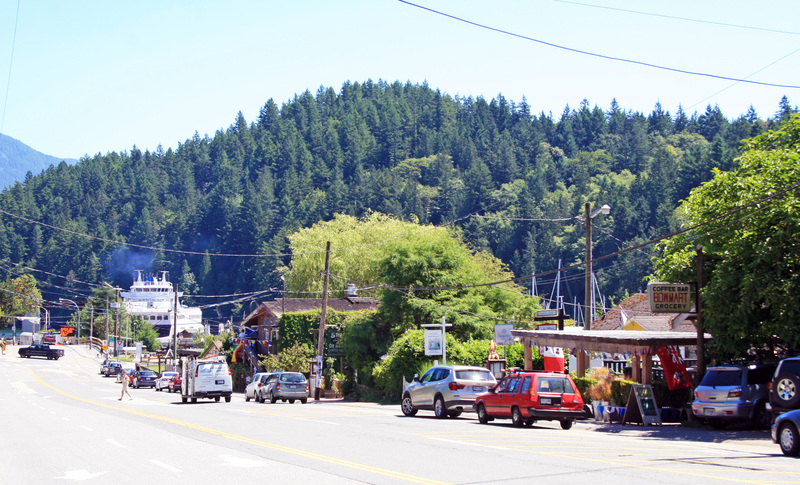 Our first stop was Snug Cove on Bowen Island. 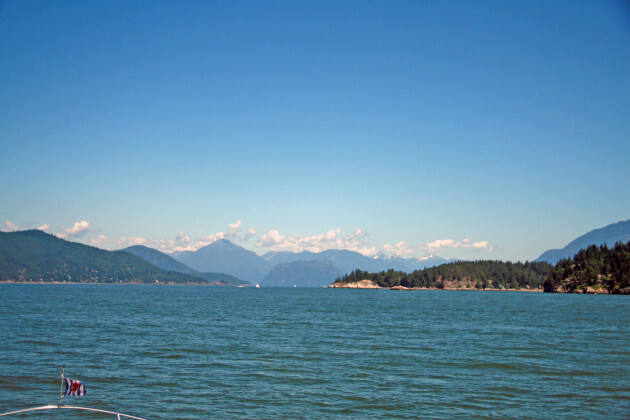 While the best way to arrive is by boat, you can also take a ferry from Horseshoe Bay in West Vancouver as many weekend visitors and residents do. Snug Cove is home to the unique Union Steamship Company Marina, a really wonderful facility with great architecture. Once the staff had us secured in a transient berth, we headed ashore to check things out and catch up with marina owner Rondy Dike. While the marina is full-time home to many boats, about one-third of the slips are reserved for transient traffic. Rondy explained most boaters passing through are from Vancouver, with several also from the Seattle area who head north to cruise the Sunshine Coast. While the marina dominates the cove, next to the BC Ferry docks, there is a small community with several restaurants, a liquor store, a grocery store and a mix of small shops. While this is great for the island’s residents and visitors, the focus for boaters is still on the marina. The main building was built in the 1930s. Since then, they have upgraded and expanded the facilities, working diligently to preserve its original look and style of architecture. In addition to the main complex, which houses a store and restaurant, there are several unique cottages for overnight accommodations that date back to the ’20s. Recent additions to the marina include the floating office and chandlery. On the second floor there’s a boater’s lounge, showers, washrooms and laundry. While many marinas have these amenities, you will be hard pressed to find any that are as outstanding and fun as these. Drawing on the marina’s special look and feel, a whimsical nautical theme with some special touches and artifacts make this centre a fun spot for boaters. After our walk through the village and a great lunch at Doc Morgan’s, we headed back to the marina and set out on the short run to another popular destination, Horseshoe Bay. Crossing Howe Sound under clear skies, we could not have had a better day for our brief sightseeing tour. The weather also clearly demonstrated why this area and beyond is called the Sunshine Coast. I have to admit the scenery was making me quite envious of the boaters who call these waters home. Rounding Tyee Point revealed a very busy harbour. Horseshoe Bay is the terminal for all of the BC Ferries that connect communities along the Sunshine Coast and Vancouver Island with the mainland. Sewell’s Marina serves recreational boaters or you can tie up on the public wharf. From any boat in the marina, the view is impressive – actually… stunning! If you are visiting BC, a Horseshoe Bay is must visit – even without your boat. 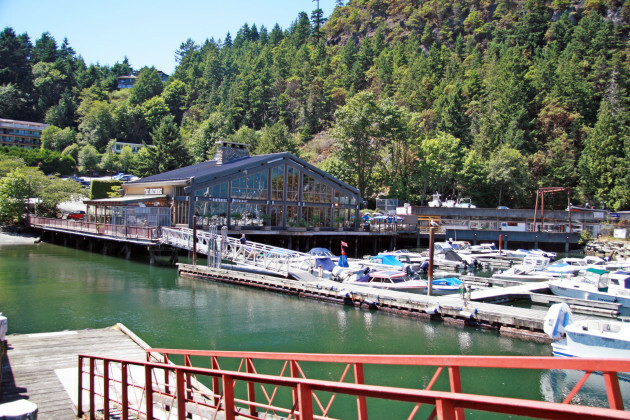 Horseshoe Bay is a great destination for local boaters with its great restaurants and shops. 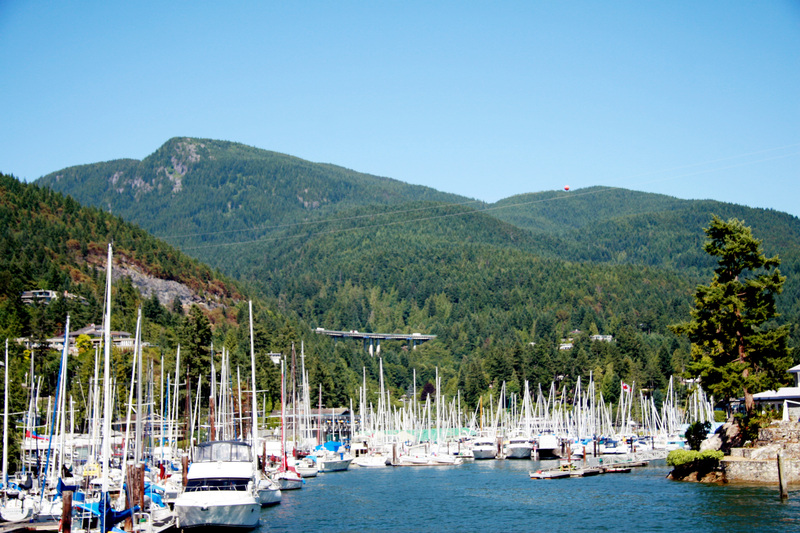 It’s also homeport to a fleet of commuter boats belonging to residents of Bowen Island. 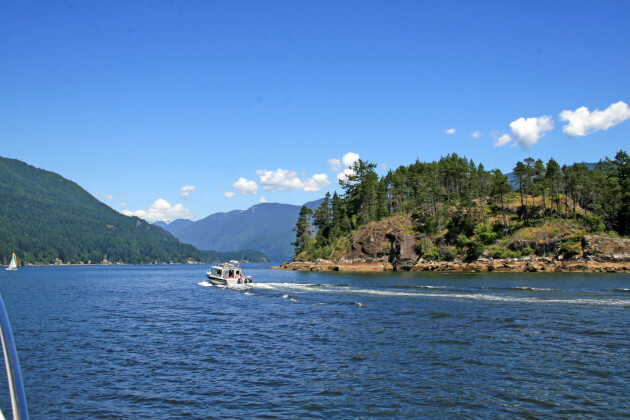 If you are visiting BC, a Horseshoe Bay is must visit – even without your boat. 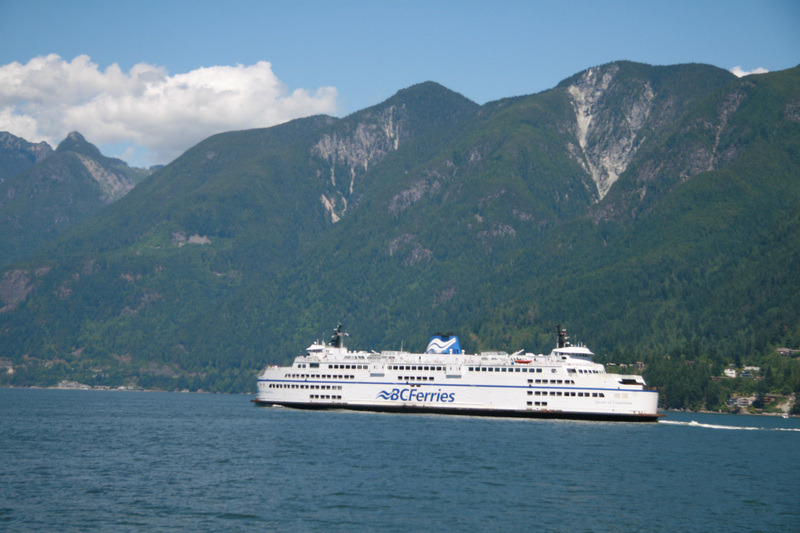 You can hop a BC Ferry and enjoy a cruise out to the Gulf Islands. If you prefer to man your own helm, you can rent powerboats in the harbour for local exploring. Underway again, and running south on the sound, we could look inland and watch the parade of homes with the coastal range in the background or look out to the islands. Along this stretch of shore is Whytecliff Park. Opened in 1909, the park is Canada’s first Marine Protected Area (MPA) and a popular diving spot. 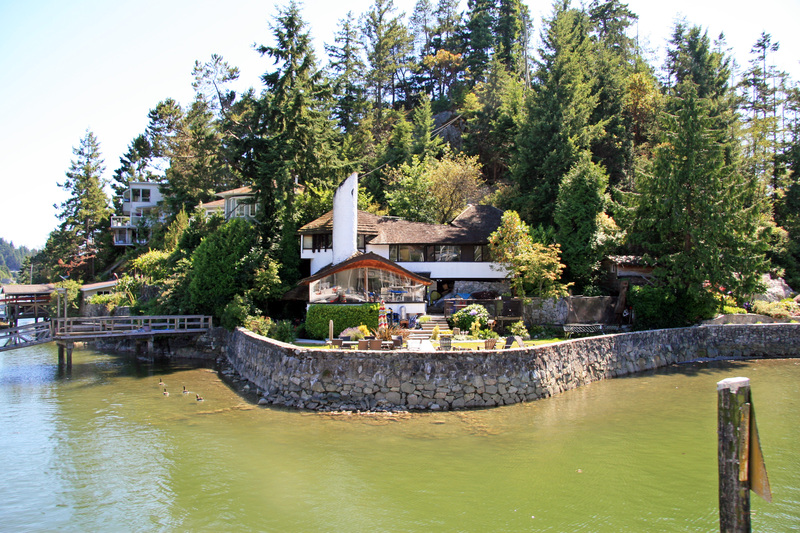 Cruising along the mainland, just before Burrard Inlet, Fisherman’s Cove and Eagle Harbour offer an interesting side trip. This is a crowded harbour with two yacht clubs and two marinas. 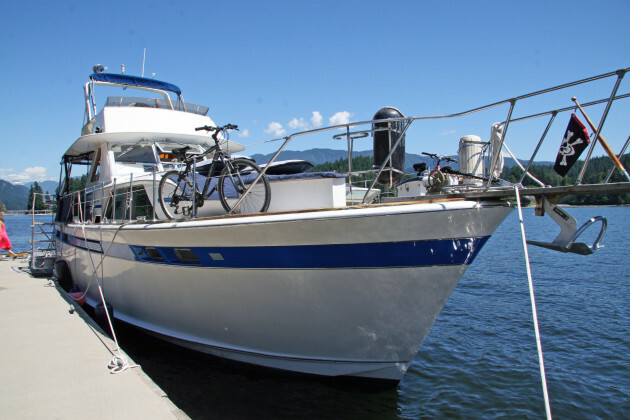 You can get fuel at Race Yacht Services, while Eagle Harbour offers slips and marine supplies. As you cruise slowly through, keep a watch for the small pontoons Eagle Island residents use to access their homes from the mainland. From Eagle Harbour, it was a short run to the Point Atkinson light and the turn into Burrard Inlet. As you head back towards Vancouver, the vista before you is quite unique. On any give day, multiple ocean-going freighters are anchored outside of the harbour with the city skyline as a backdrop. On a clear day, Mount Baker’s snow-capped peak can be seen in the distance. Passing by Stanley Park and under Lions Gate Bridge, brings you back into the shelter of Vancouver Harbour. While we were only able to spend a few days exploring the local waters, the memories of our time will last for quite a while. The trip sparked some envy that Vancouver and lower mainland boaters call these waters home, but it has also inspired me to return to the West Coast and explore more of the Sunshine Coast and its cruising waters. This destination is featured in the Fall 2014 issue of Boats&Places and in episodes 1 and 2 of the 2015 Season of PowerBoat Television.